After the BRI notified us residents of the Bearpit that we were to be graced with a new 8 storey car park above the only children's playground in the Stokes Croft area, we dropped their PR team a note On Aug 7 saying, essentially, how can you defend this? We followed this up on Aug 21, saying "hoping for a response here", and got something back saying "we will be answering this". It's now September, and as they say, "silence is usually a sign of inability to come up with a good excuse". So again, out with another email. 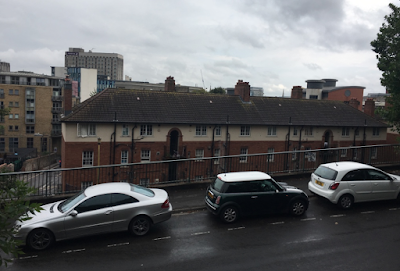 For the curious, here is the view of the staff housing they plan to demolish to make way for 800 parking spaces —the view as seen from the Dove Street flats' kids playground. That's a three storey tenement: imagine that with 5 more storeys above, brought almost up to the railings, and full of cars driving around all day. That's what the BRI wants to do. One little thing we've come across in our research is the UBHT 2020 Green vision document, which sets out their vision of a sustainable future, especially in light of the NHS to step up to its duty of reducing national CO2 emissions by 80%. Being the largest single employer in the UK, and seeing millions of patients every day, the NHS is a critical part of meeting that goal -so it's good to see Bristol's hospitals leading the way. The existing document is worth a read though, especially page 8, which estimates 1 vehicle in 20 (where?) is on NHS business -which implies they are a significant factor in our pollution and congestion issues. Travel by staff and patients is another area we currently do not account for in our carbon footprint. However, we recognise the significant environmental impact that our staff and patient travel has. It is estimated that one in twenty vehicles on our streets are on NHS business as staff patients or visitors. As such we have developed a green travel plan to reduce the impacts of travel. supporting a shift away from car travel to more sustainable and healthy transport alternatives. Sadly, the author of that paper, "Deborah Lee, Chief Operating Officer and Executive Green Champion", appears to have moved up to gloucestershire; we'll have to do some research on who is their replacement at that level, and whether the 2020 green vision has been superceded by one which discusses driving to work as a core aspect of the future. For now, though, another email to the press team, this time highlighting the fact we know that they're also the PR team for MetroBus, so are actually part of a story of their own: does the PR team for MetroBus believe that MetroBus is going to transform Bristol's transport or not? It comes across that as the communications partner for the UBHT multistorey car park, you just weren't prepared for any form of detailed analysis. Its was predictable that someone was going to say "how much will be staff? ", "don't you have 800+ spaces already when you count up all the parking across the UBHT campus? ", and "how can you say it is set back on the hill when there's a childrens playground behind?" Here's a new question then: how does the UBHT reconcile this with their 2020 green vision, which also covers the NHS's requirement to participate in CO2 reductions, and explicitly says on page 8 "It is estimated that one in twenty vehicles on our streets are on NHS business as staff patients or visitors. As such we have developed a green travel plan to reduce the impacts of travel." We are struggling to find any way to make the proposed parking defensible other than an outright admission "FirstBus/Metrobus is a failure and we've given up trying to reduce staff driving numbers". Which, given your position as the communications partner for FirstBus, puts in a somewhat sticky situation. Please can you at least supply an approximate deadline for your responses. We’re very sorry for the delay in coming back to you and still intend to answer your original query, but suggest we also wrap that response up with the issue you raise below. We’ll be in touch as soon as possible with a substantive reply.